Antiparos was sort of an accident. 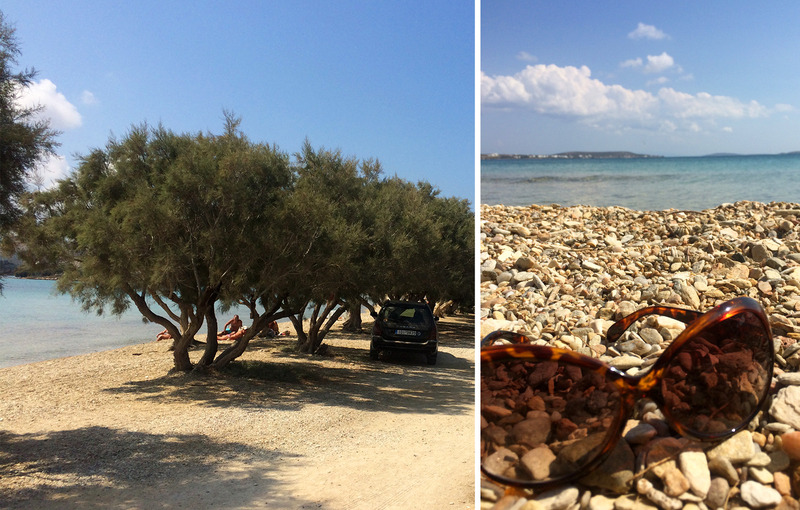 We didn’t plan on it being our absolute favorite beach in Greece, nor did we even plan on going there in the first place, but I’m glad we did. Here’s how we happened upon this dreamy island spot. 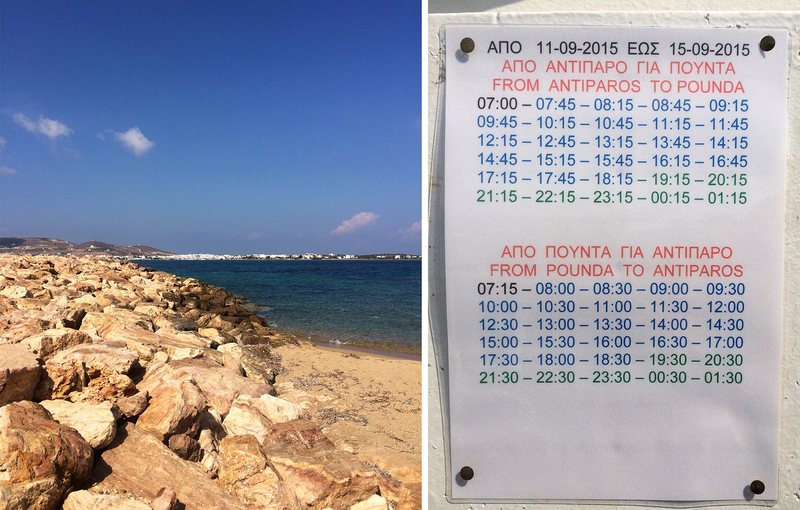 On this particular leg of our trip we were actually staying on the neighboring island of Paros. 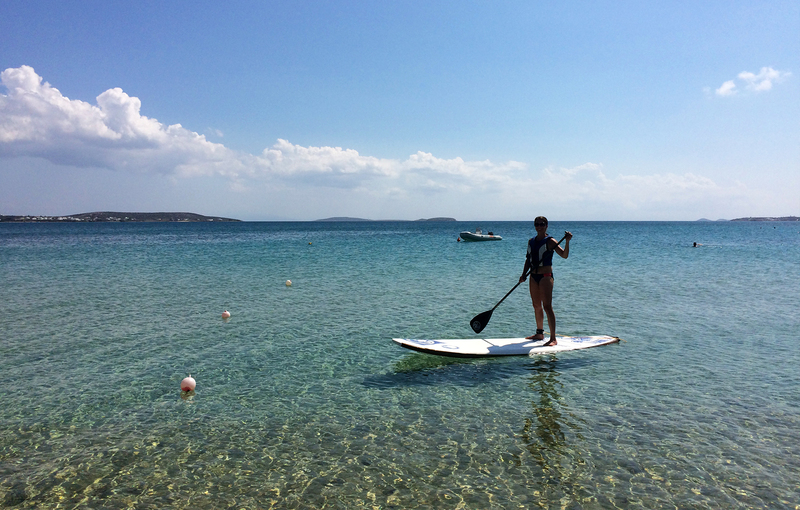 Our original plan was the take the bus to Pounta Beach on the west coast (not to be confused with the party Pounda Beach on the east) and put our balance and coordination skills to the test with a little stand up paddling (aka SUP for those in the know). We had scoped out a company online, noting important details like location and hours, but when we got off the bus we were disappointed to find that the shop was closed without a soul in sight. So too was the beach area, completely empty sans a few kite surfers off in the distance. We did however find ourselves face to face with the dock for the ferry to the island of Antiparos, located just over a mile away. So like any resourceful and agile traveler we decided to wait for the next boat in hopes of finding the “perfect” beach there. 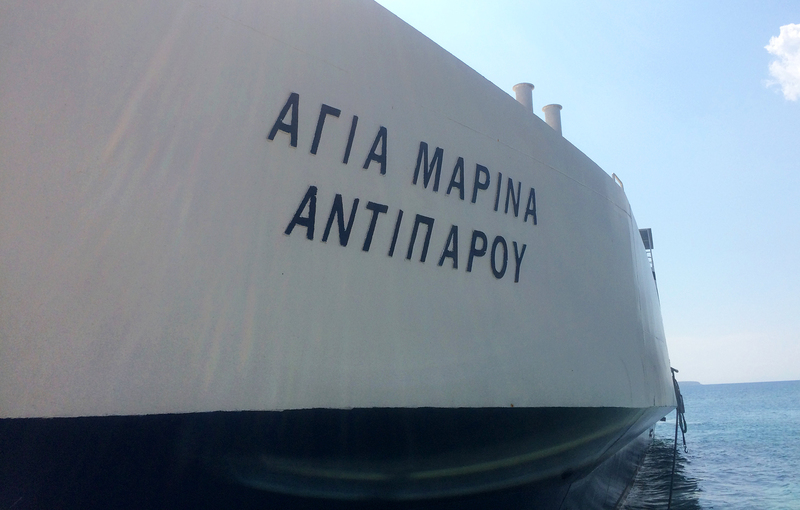 In general, ferries in Greece are a great way to get between islands, and this one was no exception. We bought our tickets as we boarded the boat, asking for directions to the closest beach, and in less than 15 minutes we had arrived in Antiparos. After a hard left and 5 minute walk from the harbor, we found exactly what we were looking for. 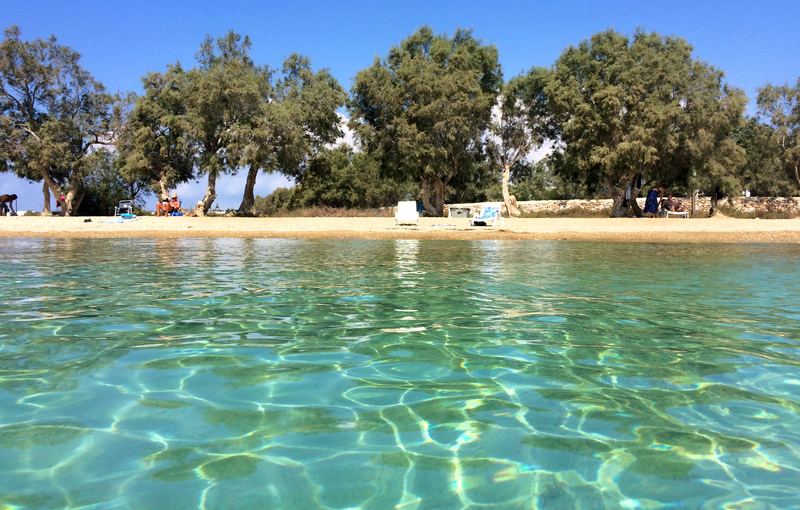 Psaralyki Beach was a casual and unpolished retreat, with small golden rocks taking the place of sand and frizzy tamarisk trees lining its shore to provide just the right amount of shade. The beach felt relatively quiet and secluded too, despite its close proximity to the dock. We spotted a stack of metal beach chairs, grabbed 2 and spread out the (overly-priced and extremely thin) beach towels we purchased earlier that morning at a souvenir shop. Soon enough a well-worn, leathery man soon came by to collect the 3 euro rental fee – a small price to pay for a day of relaxation. The water was so warm and crystal-clear that we could see right through its blue-green hue to the bottom. Large flat rocks kept the depth shallow, which allowed us to walk out a ways before it dropped off. 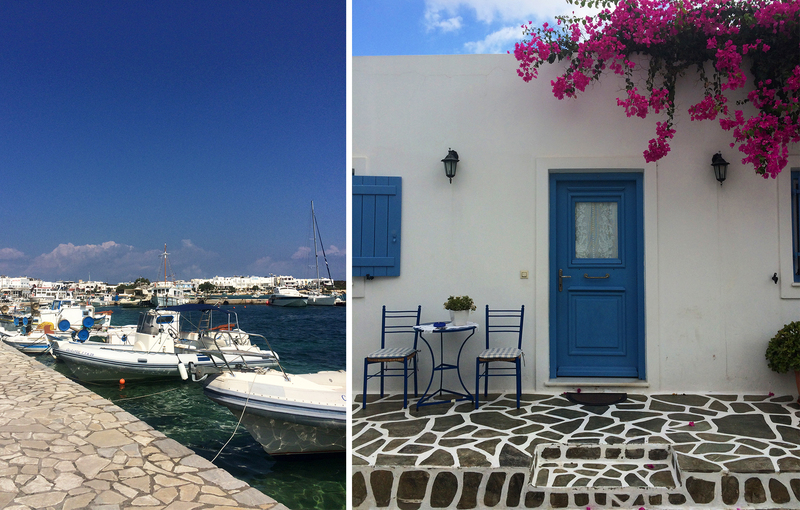 When we eventually reached our capacity of water and sun for the day, we decided to spend the remainder of the afternoon walking around Antiparos’ main town. As expected, it had all of the elements of a picturesque Greek island village – winding stone-paved streets, whitewashed buildings draped with bright pink bougainvillea flowers and lots of little shops to explore. And of course we couldn’t resist trying “the best gyros on the island” before catching the ferry back to Paros. 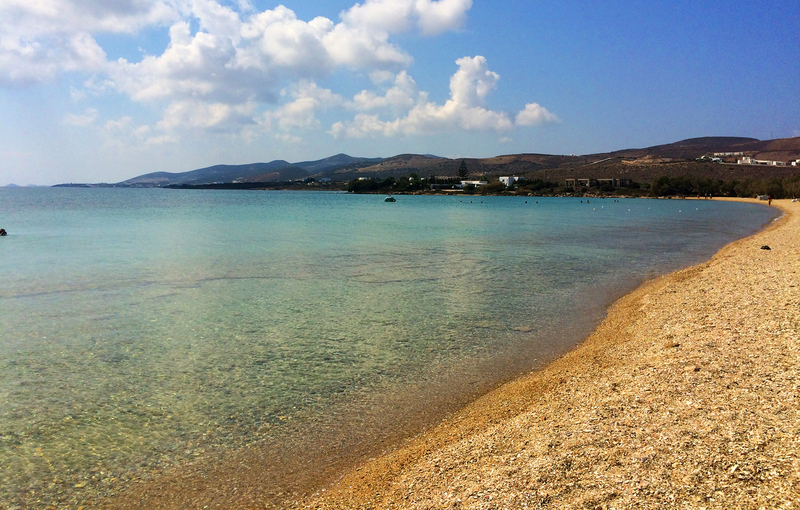 Looking back, of all of the different beaches we visited in Greece, our experience on Antiparos was truly paradise found – even if it did happen as sort of an accident. Sometimes the best things happen by accident right? The crystal-clear water of this beach looks truly amazing!